According to Eminent Welshmen (published 1908), Welsh railway champion Benjamin Piercy was the engineer "... from whose surveys and plans nearly every mile of railway in Montgomeryshire and Mid-Wales was made". He gained a reputation as an expert witness for railway proposals in parliamentary committees, and worked on a great many Welsh and border lines, including some constituents of the Cambrian Railways group. 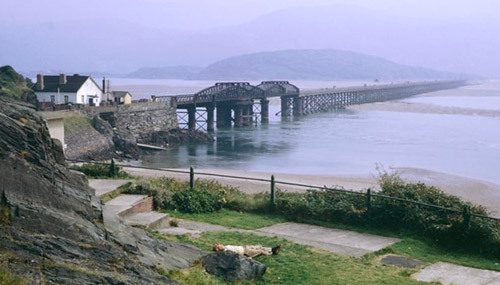 His railway viaducts over the estuaries of the rivers Severn, Mawddach and Traeth Bychan, and the Talerddig Cutting — once the deepest in the world — are testaments to his skill. He also engineered groundbreaking projects in Sardinia, France, India and Myanmar, and was decorated by the King of Italy. Piercy started his career working as a land surveyor in his father's office. From 1847, he assisted Charles Mickleburgh with surveying and road construction. He studied railway engineering in spare moments, and helped Henry Robertson (1816-88) with parliamentary surveys for extensions to the Shrewsbury & Chester Railway, as well as development of two early routes for the Oswestry & Newtown Railway. In 1856-58, he worked with David Davies (1818-90) and Thomas Savin (1826-89) on construction of the Vale of Clwyd Railway. He joined them again on the Oswestry & Newtown Railway, and worked with Davies on the Newtown & Machynlleth Railway and with Savin on the Aberystwyth & Welsh Coast Railway. He also started an enduring engineering partnership with his elder brother Robert Piercy (1825-94). In 1862, he began what would become a long association with the Italian island of Sardinia. He and Davies re-surveyed Royal Sardinian Railway Company's proposed rail routes, and considerably reduced the tunnelling and earthworks originally suggested by the Baratelli Company. Piercy negotiated concessions for the construction of the first railways on Sardinia, though work was suspended 1865-69 by war between Italy and Austria. Nevertheless, by 1872 he had completed 197km of standard gauge track, and a further 194km by 1881. He also designed railways in Assam in India, and across the Indian-Myanmar frontier. Piercy's later life was spent on civil engineering works in Wales, developing rail links to Liverpool. He held shares in many of the railways he had engineered. A practical, modest and well-liked man, he brought his schemes to fruition with thorough forward planning and diligence. In private he was both intellectual and sporty, a fine player of chess and cricket. 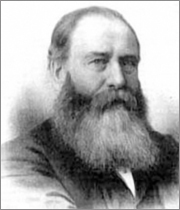 He was also generous — bequeathing money to hospitals, railway benevolent institutions, and Wesleyan and Methodist chapels. In 1881, Piercy bought the now-Grade II listed Marchwiel Hall and its estate in the Welsh county of Denbighshire, where he was a Justice of the Peace. A keen cricketer, he laid a cricket ground here in 1883 (pictured). It is recognized as one of the best in Wales and is now used by Marchwiel & Wrexham Cricket Club. 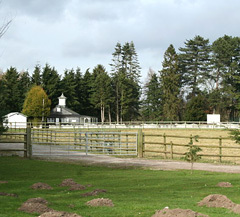 After the Piercy family, the estate was owned by civil engineer, Sir Alfred David McAlpine (1881-1944), founder of the eponymous construction firm and chairman of Denbighshire Cricket Club. Villa Piercy on Piercy's 3,700 hectare estate at Badde Salighes, near Bolotana, Sardinia, Italy — near the highest point of the Sardinian Railway network. The family used the estate from the 1880s onwards and a number of Piercy's descendents married into the Italian nobility. Giuseppe Garibaldi (1807-82) was among Piercy's guests here, and his son Ricciotti Garibaldi (1847-1924) was Piercy's godson. 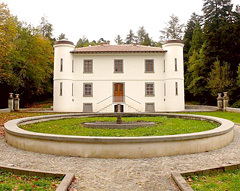 The villa was restored in 2005-07. In 1852, Piercy prepared drawings for the proposed Shrewsbury & Welshpool Railway. He succeeded against strong opposition in getting the bill for the railway through Parliament, establishing himself as a parliamentary committee witness and precipitating his involvement in a great number of Welsh rail proposals. 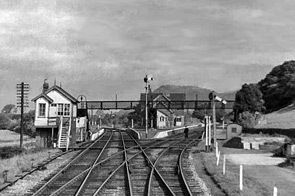 The picture shows the railway peeling right, splitting from the main Oswestry to Welshpool line at Buttington Station (closed 1960). The photo dates from 1963. 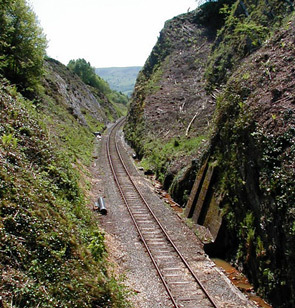 Talerddig Cutting, constructed in 1859-61, lies at the summit of the Newtown & Machynlleth Railway in Powys, Wales — engineered by Piercy and his elder brother Robert. The cutting is reached by gradients as steep as 1 in 52. It is 366m long with the rail track some 37m below ground level, making it the world's deepest railway cutting when completed. It remains one of the deepest cuttings on British railways. Grade II* listed Barmouth Viaduct, built 1864-67, crosses the estuary of the River Mawddach carrying the Aberystwyth & Welsh Coast Railway. It was constructed under the supervision of first Piercy, then Henry Conybeare (1823-84), George Owen (c.1827-1901) and Alfred Jones Collin as chief engineers. At 699m long, it is one of the longest timber viaducts in Britain. Its opening span, originally a sliding drawbridge, last opened in the 1980s. 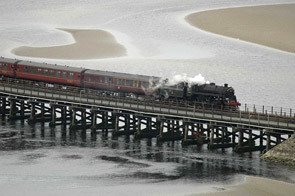 Piercy's Grade II listed Pont Briwet or Penrhyndeudraeth Bridge, constructed 1865-67 and shown here in 2008, was a timber rail and road bridge across the River Dwyryd in Gwynedd, Wales. It had 22 spans in timber and carried the Aberystwyth & Welsh Coast Railway. However, it has recently been replaced by a wider prestressed concrete bridge.